Rahul Dravid: Start of 2nd innings in ODI career: Welcome back The Wall! Start of 2nd innings in ODI career: Welcome back The Wall! Hurrray! He is back in ODI squad after 2 long years.To be frank, this was unexpected.The situation that time was such that it looked almost impossible to see him in "Blue". Conclusion-the reason why he was dropped was not strong enough to end his ODI career. Selectors saw the youngsters living uncomfortable on tricky wickets, bouncers were played horribly, swing bowling was eating out their patience-- and there was only one who could stand tall, Rahul Dravid.Although the main reason being given for his comeback is the "bouncers", selectors know it's not the only one! Why has he been brought back? He said he didn't look at the recall as a chance to prove his detractors wrong. 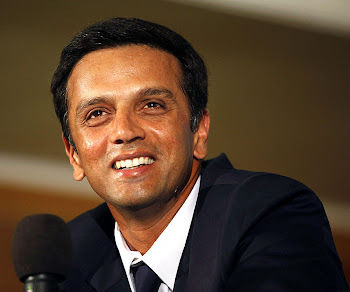 "I have never played my cricket that way, wanting to prove a point," Dravid told the Deccan Herald. "To me, it's about trying your best to be the best you can be, day after day, in whichever format you are playing and for whichever team you are playing." Dravid, who has had a long break after the IPL ended in May, said: "It's nice to be back, I am very happy. I am looking forward to the Sri Lanka tri-series and the Champions Trophy in South Africa, to giving it my best. It will be nice to catch up with the boys once again." Dravid has played 333 ODIs and is among a few batsman to have made over 10,000 runs in the format. "I will do my best for the team's cause," he said. "I have always believed in preparing well before a match or a competition and it will be no different this time." The tri-series including Srilanka, New Zealand and India will be starting from 8th September.